April In Paris, written and directed by John Godber, showcases what Godber does best - intimate and true-to-life insights into the minutiae of married life. As the first few bars of Handbags and Gladrags play we are introduced to the two main characters who are bickering like the married couple they are. After 27 years of marriage shoe shop worker Bet and unemployed Al have reached that point in their relationship where they find everything about the other irritating. Their luck begins to change when Bet wins a night in Paris - after a brief debate about who she is taking, the pair head off to the city of love to see if they can rekindle their own. Shobna Gulati and Joe McGann deal with the demanding roles of their characters with ease. Each line is delivered with enthusiasm and there are laughs to be had, particularly during a restaurant scene where steak tartare has been ordered in error. A multi-purpose set becomes a back garden, boat deck and nightclub while church windows and subway carriages are depicted with clever use of light and shadow. 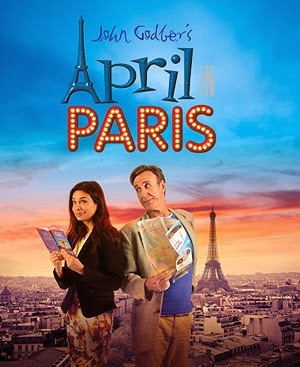 It may not be action-packed but April In Paris manages to provide a touching portrayal of marriage that is truly relatable, demonstrated by the laughs and sighs of recognition audible throughout the audience.